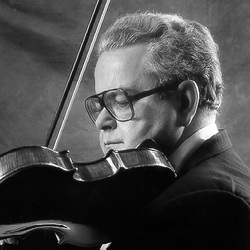 Violinist Alvaro deGranda joined the first violin section of The Cleveland Orchestra in 1966, appointed by George Szell. In 1968, Mr. Szell promoted him to assistant concert master, a position he held for 31 years. A native of Havana, Cuba, Alvaro deGranda began studying the violin at the age of four and made his first public appearance as a violinist when he was six. At 14, he was awarded a full scholarship to The Curtis Institute of Music in Philadelphia, where he studied with Toshiya Eto and Efrem Zimbalist, Sr. He also studied in Europe with Yehudi Menuhin and Nadia Boulanger. Upon graduation from Curtis at the age of 20, Mr. deGranda was appointed to the first violin section of the Houston Symphony Orchestra by Leopold Stokowski. Two years later, Mr. deGranda was named assistant concertmaster of the Saint Louis Symphony Orchestra. He served in that position for four years before joining the Cleveland Orchestra. Mr. deGranda has performed in the United States, Europe, and Latin America, and has participated in the Aspen, Casals, and Marlboro music festivals. Mr. deGranda and his wife, Ilse, have two grown sons.